With powerful music and lyrics that move effortlessly from Americana to blues to country, this duo has you dancing from the first song, and leaves you with a need to tell Mom you love her by the end of the album. Grady Miller is the engaging combination of Cathy Miller's powerful voice and bluesy fiddle and Michael Grady's amazing guitar work and vocals. These songwriters draw you into their stories, creating people and places that are easy to identify with. They combine the structure of classical training (Cathy has a degree from Vanderbilt University) and the freedom of having learned music from the masters: Eric Clapton, Robben Ford, Gillian Welch, and too many other influences to list. 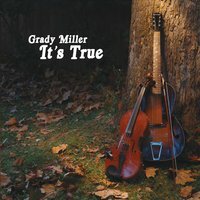 "It's True" is the first duo release for Grady Miller. This album ranges in style from rock to country to blues, and they way they blend such diverse styles is brilliant. The entire album gives that feeling of sitting on the front porch jamming with your friends. Songs range from the quiet emotion of a mother and son relationship in "She", to the over-the-top blues anthem "Yo Momma Blues". Each tune is unique and well-written, and captures a moment in time. Miller and Grady performed as The Steelheaders previously, having released "Live at The Sweet Pea Cafe"in 2012. Cathy Miller is relatively new to writing and performing original songs, having spent most of her career as a classical musician. She has a degree in Viola Performance from the Blair School of Music at Vanderbilt University, and has shared a stage with a number of fantastic musicians including Christoph von Dohnányi, Kurt Masur, Jahja Ling, The Cleveland Orchestra and Judy Collins to name a few. She played for three seasons with the Huntsville Symphony in Huntsville, Alabama under the direction of Taavo Virkhaus. Beyond the world of classical music, Cathy has performed in bands ranging from rock and bluegrass to ceili (Irish group dancing) and has worked as a session artist for songwriters across the country. She brings a deep knowledge of music theory and harmonization to her work, and incorporates them into her vocal and fiddle style. Her brand of fiddling incorporates elements from traditional Irish, bluegrass, country, Western swing and jazz, blending them into a unique sound and structure. She has led workshops along side Denny Jones, Bill Lestock and Lynn Frederick for the Kent State Folk Festival. She is particularly passionate about playing with a very relaxed technique and incorporates that focus in her workshop presentations. Her songwriting style ranges from country and folk to rock, and has been compared to such greats as Kris Kristofferson and Alison Krauss. Although viola was her primary instrument, there's no denying that she has developed a powerful voice. She has a range, projection and command of her vocals and uses those to her advantage with her song construction. Cathy has been teaching privately for 23 years and currently has students in fiddle, violin, viola, vocals, cello, upright bass, bass guitar, guitar, mandolin, songwriting, and piano. She lives in Akron, Ohio with her partner Michael Grady. Michael Grady has been writing and performing original songs for more than 3 decades. He has studied the art of songwriting and guitar extensively, and brings a wealth of knowledge of the art of song craft to his seminars. He was a co-founder of the Rambling River retreat for Song Making, led workshops at the Kent State Folk Festival, and led songwriting workshops along side such great musicians as John McCutcheon, Peggy Seeger, Bob Franke, Karen Reynolds and Michigan Winter Sing leader, Sally Potter. He has also had the privilege of sharing the stage with the likes of Darrell Scott, Bill Staines, Peter Madcat Ruth, Bob Franke, John McCutcheon, and Rick Thum. In 2004, he attended Lamb's Retreat for Songwriters. He has been performing with Cathy Miller as the duo Grady Miller since 2012. Together, they blend excellent songwriting with impeccable instrumentation and vocal harmonies. Their songs capture your imagination and their performance keeps you rooted to your seat. Michael was the winner of the most recent Kent State Folk Festival Talent Contest. He has been teaching private music lessons for the last 10 years in a variety of instruments including: guitar, bass guitar, banjo, mandolin, piano, drums and ukelele. He attended Grand Valley State University in Grand Rapids, Michigan. He and his partner Cathy Miller live in Akron, Ohio.